CultureLink’s mentorship program is offering a series of sessions to practice Public Speaking and Beyond! Public speaking is crucial in most careers as well as in our day to day lives. Sometimes we need to speak up to share our ideas in a professional setting or make a presentation or if we are in a supervisory role, we need to motivate our staff. Sometimes, we want to share our stories of a weekend getaway or crack a joke with our friends or colleagues in a most interesting way. Sometimes we might be accepting an award and are asked to say few words or make a toast at a best friend’s wedding! Not matter what’s the occasion, there are lots of ways to present and make a speech! However, no matter how professional and confident one may be, every once in a while there’s a hesitation or fear of standing in front of people and talking about something…what a horror! Yes, it is a proven fact that many of us suffer from fear or anxiety of speaking in front of public. Everyone reacts to it differently. For some it is stuttering or mumbling, for others it can be shaky legs or sweating. For some it’s easier to make a speech in their first language but they get terrified if they have to present something in another language. But with continuous practice and encouragement, this fear and anxiety CAN BE DEFEATED! Many who don’t suffer from anxiety, they need space and audience to practice and gain more confidence! 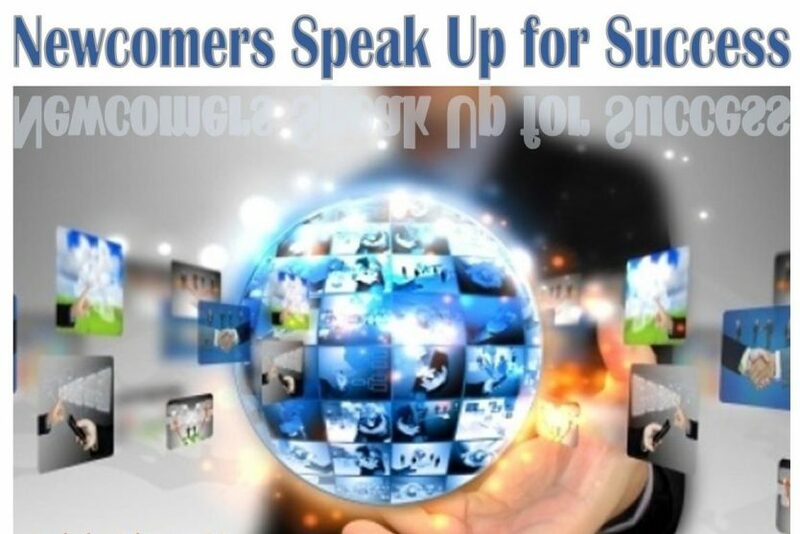 Newcomers Speak Up for Success is designed to help those newcomers who would like to try or practice public speaking in front of an audience either for job purposes or for the sake of personal interest. Currently, this program is designed to run bi-weekly for 10 consecutive weeks and once in a year! Each session is 2.5 hours long which includes presentation, discussion on related topics and hands-on practice and homework assignments (if required); and one 15-minutes break. Sessions are offered in a friendly and motivating environment with demonstration, guidance and feedback from mentors who have background in public speaking. 30-40 minutes of each session will be reserved for impromptu or prepared speeches. Participants will participate and learn at their own pace. In the first session, participants and mentors will get a chance to get to know each other and decide on the topics for each session. The last session is generally about presenting final speeches (if the attendees decide to do so) followed by group photos, awarding certificates and a potluck party. Adding humor – is it necessary? What’s trending in public speaking? etc. Meet likeminded peers who may experience the same emotions when standing in front of a crowd, either be large or small! Are a newcomer (landed immigrant or convention refugees – a copy of documents is required). Note: Participants will be interviewed and shortlisted to participate in this program. If selected, they will be asked to fill out a registration form and a media release form. and reference check is required.